Cashmere is used for its fine texture, strength, and softness. Keeping your neck and chest warm is a challenge during the winter. Easily solve that problem with this soft, insulating cashmere shawl scarf. These fashionable patterns and color combinations can be paired with your favorite coat, jacket, sweater, or suit. 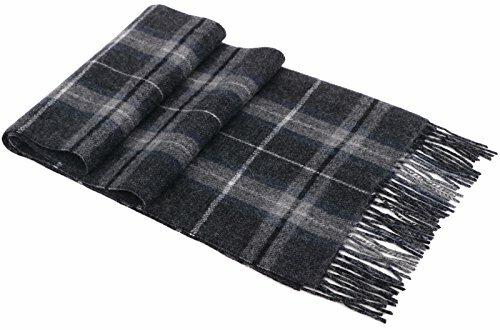 Measurement: Scarf: 64.5" x 11.8" (without tassel), Tassel Length 3"
Gift Box: 6.7" x 9.4"
Use professional, or mild detergent. Soak it in warm water at about 85 F-degree for 10-15 min. Squeeze the key stains out and gently rub the remaining. Do not twist after wash, roll to dry with towel. Avoid direct sunlight, put in a shaded and ventilated place to dry. Keeping your neck and chest warm is a challenge during the winter. Solve that problem with this cashmere shawl. Superior insulation and length provide you with a warm scarf that can be styled in multiple ways while keeping you safe from the freezing cold. Measures Size 64.5" x 11.8"